That should have been around 1:01 of the time of the video. 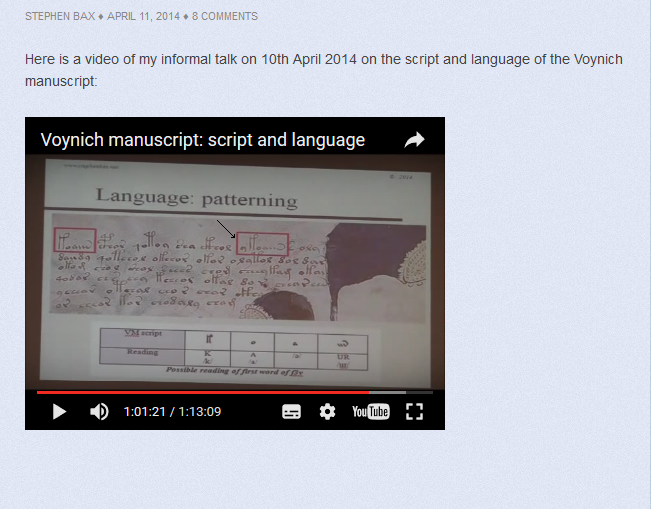 I was watching your video on the script and language of the Voynich manuscript. Around 1:13 you’re discussing how an added letter, possibly “n” kind of sound (see screenpicture…) can change the meaning of a word. To me it very much appears as if the addition of such a letter and/or sound to a word (e.g. as the name for a plant etc. ), is meant to represent a plural. As in; plant and plants, where the additional s represents a multipple of the thing or object that is described. I’ve been thinking and remembering one of my college classes and how in there, we learned that there were many times when people mixed languages to make sort of a pidgeon language so that people of different languages can talk to each other, for trading or whatever. Well, those languages are either always in development or may not have firm, definite rules for everything. You mentioned thinking that this text came from the Silk Road, which is a trade road. Things that are written down are for the wealthy and others who may be able to read but might not be able to write. Traders can read and can write some but may not be able to write entire books (or may be able to). Two ideas I’ve thought are that: this is a book for a tradesman (you mentioned Geomancy and it could be a tradesman’s book on Geomancy, such that they make money off it) or/and it’s a book for those able to read who want to read about Geomancy. It could be something other than Geomancy, which would work for these ideas, as well. The pidgeon language idea explains the several, similar words that could all be the same word. The Silk Road started in Europe and ended in Asia (or vice versa, however you want to see it) so this could be a mix between those two language bases, giving you the Persian similarities but not fully Persian… or whatever else you could find in the text. It was just something that was kicking around in my mind. I just viewed your April 10 YouTube presentation, and I am more convinced than ever that your linguistic approach to the analysis of the Voynich Manuscript is going to prove successful in the long run. Only that sort of treatment can allow for the medieval variances in spelling and even calligraphy that are so typical of the time. One note on the matter of an original underlying language: the occurrence of Arabic roots in plant, star, and zodiacal names may simply reflect the fact that in the 15th Century no western culture had so much as attempted a rational, scientific approach to the everyday world, and was still relying on the body of knowledge amassed over the prior centuries in the middle east. The technical terms could be Persian, the body of text something quite different. I do think your most promising new lead is in the identification of the symbol that looks like a fat comma (possible sound: N) which can occur at the beginning or end of a word and also can stand alone. Only a linguist could track down such a peculiarity, but it is just the sort of indicator that is likely to be the most productive in tracing the source. I first heard of the Voynich Manuscript about thirty years ago, and until I found your site I had sadly watched the “progress” go in the classic two directions: hyper-mathematical statistical analysis of dubiously interpreted symbols versus outright voodoo. Thank you for the first truly rational approach to this most fascinating topic! Thank you for your kind comments and interesting observations! Hi Stephen, could you upload the video in a higher resolution? It’s sometimes hard to see the pictures and writing due to low resolution of the video. I will try. I’ll also post the slides themselves. Thank you very much for sharing this talk, Stephen! It’s a clear and informative presentation of the progress you have been making since the publication of your paper. I like the idea of Tishtrya / Sirius as the star next to the Pleiades in f68r! Suggestion compare it with celtic language. I got a hunch that it could be an book of celtic medicine and rituals . The pictures look a bit like celtic art . And the text has similar rytm like the tales of Cuchulainn.